Can We Know the World and Still Love It? In yesterday’s Life for Leaders edition, we were encouraged not to miss the beauty of this world that God built in from the beginning. As you read that devotion, you may have felt a bit uncomfortable. A nagging question may have troubled your soul: How can we delight in the beauty of creation when the world is so filled with injustice, suffering, and brokenness? The daily headlines don’t read, “Exceptionally Beautiful Trees Discovered.” Rather, they speak of destruction, torture, racism, violence, pollution, and all measure of pain. It’s not uncommon, in fact, to read of the destruction of countless trees by human or natural pests. How can I read the news and still delight in this world? A similar question has been raised in an award-winning book by Steven Garber called Visions of Vocation. Taking seriously the brokenness of the world, Steve asks, “Can you know the world and still love it?” He is no Pollyanna about how difficult this can be if we are truly in touch with the world’s pain. “There is not a more difficult task that human beings face,” Steve observes. Yet, he believes this is possible. Knowing and loving the world comes, not by denying its brokenness or pretending as if all is well, but rather by living in the tension of a world that is both beautiful and broken. Knowing the world and loving it comes as a result of knowing and loving the God who created the world and who calls us to know, love, and serve the world. I am greatly simplifying Steve’s argument, of course. I commend his book to you for the nuances and delights of his writing. As I read Visions of Vocation, I was reminded of a beautiful place I visited in Virginia, not far from where Steve lives. In 2006, my daughter, Kara, and I made a trip to Virginia, which was the topic of her school state report. There, we spent an hour at the Fredericksburg and Spotsylvania National Military Park. It was a gorgeous spring day. The trees were budding and we could see the crocuses poking up from the ground. The park was quiet and uncrowded. There, surrounded by such beauty and peace, Kara and I read of brutal warfare, painful deaths, and extreme suffering. Some of the most savage fighting of the Civil War happened in this natural paradise. I felt torn as I read about what happened in this place, torn between enjoying its natural delights and being horrified by what human beings once did here. The tension between the natural reality and the human reality was hard to sustain. Yet, it seemed wrong to break it. I felt as if the Lord wanted me to hold together that which is so easily divided: beauty and ugliness, succor and suffering, warfare and peace. Why is it important for the people of God to love the world, including its beauty, even while acknowledging its brokenness? I would suggest two among many reasons. First, the beauty of the world sustains and restores us. If we’re going to engage the huge challenges of the world, if we’re going to do justice, love mercy, and walk humbly with our God, then we need to draw sustenance from the beauty and goodness of God’s creation. Second, the beauty of the world encourages us to live faithfully in the eschatological tension of this age. We love beauty now, believing that one day God’s beauty will be uncompromised. We strive for goodness now, knowing that God’s goodness will one day prevail. We seek justice now, confident that God’s justice will one day cover the earth. Can we know the world, both its beauty and its brokenness, and still love it? Yes, by God’s grace, however imperfectly, we can. When have you felt the tension between the beauty and brokenness of the world? Have you been tempted to emphasize one and deny the other? What helps you know the world as it really is and love it? Gracious God, for the goodness and beauty of creation we thank you. For the way your creation nurtures and inspires us, we are grateful. Yet, the more we pay attention to the world, the more we see its brokenness as well as its beauty. We wonder if we can know the world as it is and still love it. In this, as in all things, we need your help. Even today, Lord, may I see and delight in the beauty of this world. May this draw me near to you with gratitude and wonder. By your Spirit, may I also see the brokenness of the world, not drawing back from that which is painful. Grant me your vision, your compassion. Help me, I pray, to live in the tension of the beautiful and the broken. Help me to know this world truly and to love it, even as you do. Amen. 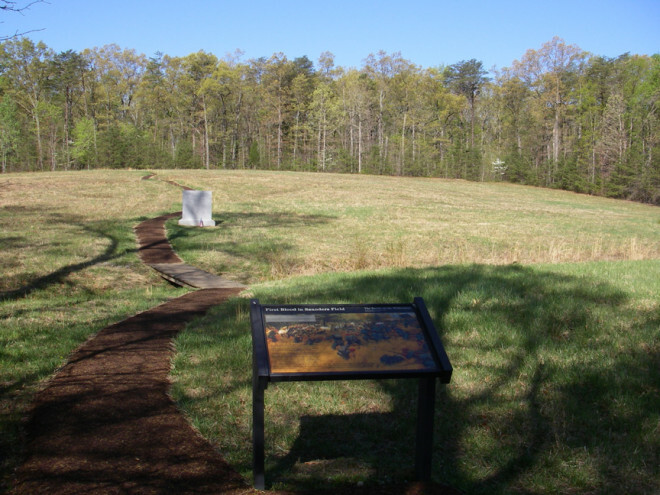 Photo of Fredericksburg Battlefield courtesy of Mark Roberts. I really appreciate this devotion, Mark. For the last 13 years I’ve in Uganda, working with orphans and fragile families. The civil wars in what is now South Sudan and in Uganda devastated the lives of millions of people. Even now that the wars have ended, the hearts of the people and the infrastructure of the areas in which they live are raw and deeply in need of healing. When I am these areas, my heart is heavy with pain. Sometimes, after spending a week or so in the area, I ride on the top of a Land Rover through the nearby national park (one of my favorite things to do in all the world). The breeze in my face, the sweeping savannah, the herds of elephant, antelope, and cape buffalo, the towers of giraffe, bloats of hippos, families of warthogs, the occasional lion, leopard, or hyena, the multitude of birds with stunning color — all help my heart, mind, soul, and even my physical body find rest and peace in God. Thanks, Mark, for another thought-provoking, challenging devotional.